This item is DISCONTINUED. * Click here for the replacement item, COL2. More straws, cheaper price. These big straws are just what I've been looking for. Perfect for thick shakes. good quality and pretty colors--they work great for our shakes. Great service and fast delivery These straws are a real hit with the grandkids Love them for fruit smoothies! Great service and a great price. Received my straws quickly, and I can use them for my health shakes. Thanks, Prairie Moon for the quick and flawless delivery. I used these straws when I had wisdom teeth extracted. They are perfect for drinking thick fluids without causing much vacuum. Later I used these same straws for a morning smoothie that is made in a blender. There is almost no way to drink this thick smoothie without a thick straw. At 12mm this is the thickest straw that I will use. Any bigger and I may as well add a funnel to the process. I can drink about 16 ounces of thick smoothie in about 4-6 seconds with this straw. In conclusion, I would recommend this product to anyone about to get their wisdom teeth extracted, and I would also recommend this product to anyone that is drinking thick shakes or smoothies. It really gets the job done! Love these straws for my protein shakes and my iced coffee in the morning . 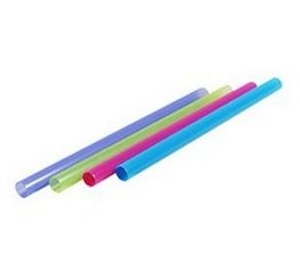 Looked for straws like these at retailers but luckily found online at a fair price . These neon colored straws are great! I love the colors and they are wonderful for shakes, smoothies or home-made icees! These are great for thick smoothies and shakes. These straws are perfect for smoothies -- large chunks still go through. Way better than the slushie straws I used to buy!